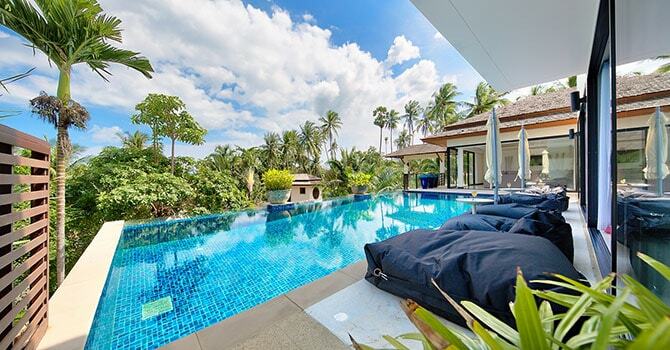 Baan Maliwan is a 3 bedroom seaview villa in Bophut, the epitome of island luxury lifestyle. Featuring chic Thai artwork paired effortlessly with sleek, modern amenities, it offers the best of all worlds for families and groups. 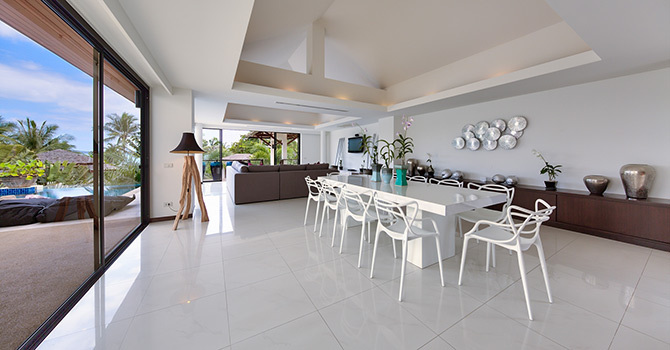 The property is laid out for everything from a relaxing family lunch to a poolside cocktail party under the stars. Under expansive blue skies framed by tropical palms and greenery, the oversized blue-tiled pool and pool deck, complete with plush pool cushions drenched in sunlight, is an entertainer’s dream. Inside, an open-plan living area and professional grade kitchen sparkle with top of the line appliances and rustic driftwood furniture. 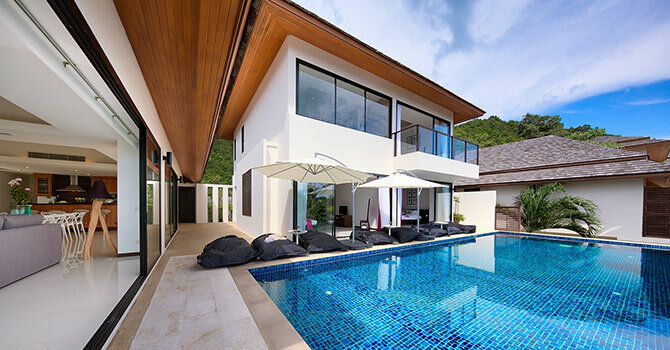 Whether you’re looking for relaxation in nature or the perfect place to host a stylish party, this Villa won’t disappoint. 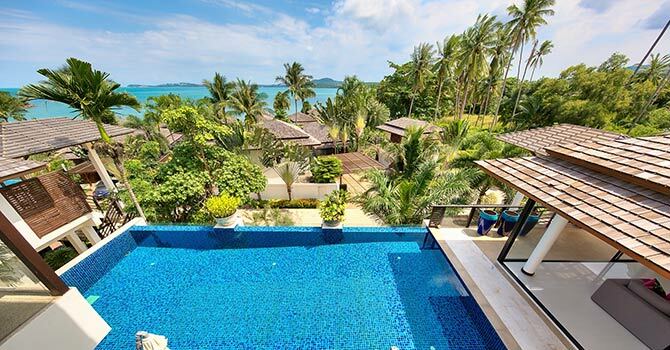 The luxury villa is well-located in beautiful northern Koh Samui, near Bophut Beach and less than a ten minute drive from the Fisherman's Village. Nearby there are many cafes and restaurants to enjoy. 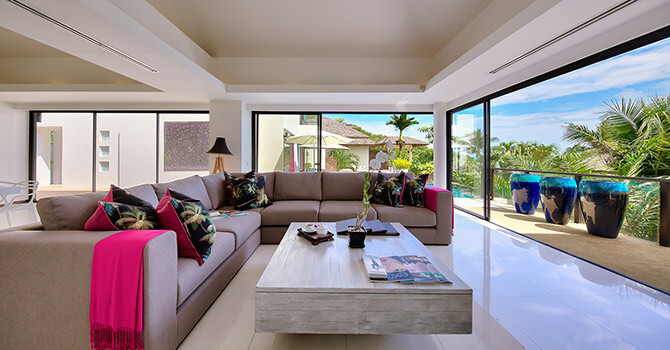 Each of the villa’s three stylish bedrooms feature air-conditioning and a private en-suite. Two of the bedrooms have king-sized beds, while the Master Suite’s bathroom also has a luxurious bathtub. The Master Suite opens up onto a balcony with sea views, while the second bedroom steps out into the garden. A third bedroom with two beds is perfect for children.  Excellent service Positives: Service: Service was excellent and very attentive both before and during our stay. The agency has been very helpful in the time leading up to our trip, helping us organize activities ahead and changing our reservations (several times) as needed. They generally responded immediately to our emails. We were worried about concierge services (not being in a hotel) but they were fantastic about organizing stuff for us and accommodating all of our requests (not always easy). We were 5 adults (2 couples and 1 single) with different requirements. 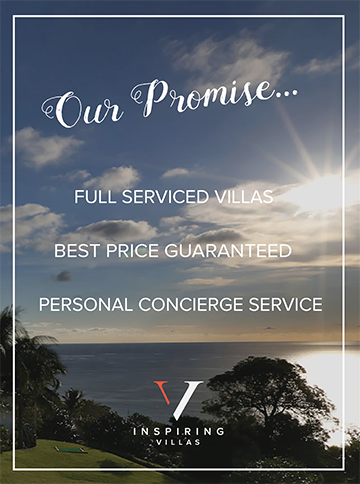 They assigned an agent on call to us and he was eager to help and came by our villa to make sure everything was ok. We rented a car through them and everything went smoothly. The rental car was delivered and picked up at our villa. They organized a boat trip for us which went very well. They even made sure to organize our lunch for the boat trip and have it delivered to the boat, and they came to pick us up to bring us to the pier and back. One of our friends got sick and they immediately organized a doctor. For New Year's Eve they organized a van with driver to be with us for the entire evening. At the villa we had 3 full-time staff and they were all very kind. The manageress made sure that we always had what we needed and helped coordinating with the agency for our activities. She was very helpful and attentive. She organized a chef for us one evening and it was one of the best meals we had in Thailand (definitely the best we had in Ko Samui). The manageress also prepared us breakfast every morning, which consisted of breads, croissants, cereals, fruits, juices, tea, coffee, milk. The villa: The villa was nice and comfortable. All 3 bedrooms are nice and have good bathrooms. The living/dining room is also nice and spacious. It is kept very clean. The pool is pleasant. WiFi connection is good. Unfortunately, there isn’t much of an outside area to hang, but we knew that from the pictures. Negatives: What we were very disappointed about is the beach (or lack of it). From the pictures and description it seemed that the complex had a very nice beach. However, it was very small and unusable. Hence a 4 rating instead of 5.